When I was young, between 7 and 13. I spent my summers reading books about ghosts, bigfoot, UFOs, and ESP: all nonfiction stuff that purported to discuss their subject matter with a journalistic eye. Some managed that better than others. The most intriguing individual story was about Devon, a town in England, tightly in the grip of winter. There had been a heavy snowfall the night before, and when the people left their houses the next morning, they observed something strange. In the pristine white meadows of snow and hilly snowdrifts, there was a trail of what looked like hoofprints that went from house to house. These tracks traveled in single file over 100 miles. They scaled walls–in one case a fence fourteen feet high. They were found on top of sheer walls. They climbed roofs, would stop and start again a great distance away. They even forded a two mile stretch of river. In many instances the hoofprints went up to the front doors of houses and back down to a trail. It was as if the devil were marking houses, checking on people, taunting them. It frightened and captivated me. I never forgot that story, but for many years I had no way of verifying it or even finding mention of it. Once I was well into adulthood the story had a question mark over it in my memory. Did I make it up? Was it actually in a work of fiction that I forgot everything else about? And then… internet. It was maybe 10 years ago that I thought about that case again–I can’t remember what brought it to mind. I hit the interwebs, and there it was. It was real. Most of the facts of the case were as I remembered them. Magic still existed. The great thing about this story is how unexplainable it is. You’ll notice that many of the skeptical dismissals almost seem more far-fetched than the supernatural ones. Some of the skeptics even have the facts wrong. This is one of those cases that perhaps gets the immovable skeptic to start grasping at answers. 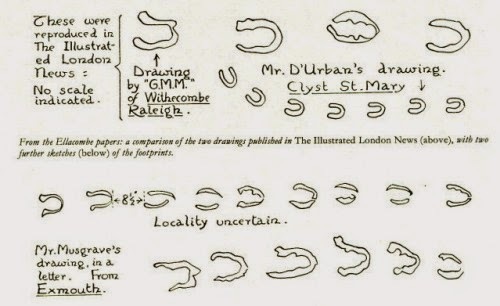 On the night of February 8th, 1855, in South Devon, England, footprints resembling cloven hoofs measuring about three inches long and four inches wide proceeded all through the wide open for an aggregate of more than 100 miles and, with the exception of veering at different houses, for most of their course took straight lines. The tracks were found in spaces enclosed by high walls. They appeared to enter a four inch pipe and come out the other side. The prints stretched from Exmouth, up to Topsham, and over the waterway Exe to Dawlish and Teignmouth (The Times 16-2-1855). R.H. Busk, in “Remarkable impressions in snow, S. Devon” says the impressions seemed to stretch as far south as Totnes and Torquay; and that there were different reports of the prints in Weymouth (Dorset) and Lincolnshire. For each situation, the prints would continue for a total of 60-100 miles before unexpectedly ceasing. In Topsham, England, the early risers were the first to find them. A baker noticed some unidentified tracks near his shop. He dismissed them until he later heard similar stories from neighbors. A set of the prints even bridged a two mile span of the river Exe, continuing on the other side as if the creature had walked over the water. The townspeople were baffled and, toting clubs, rakes, and other weapons, they set off to find the monster that created the footprints. They criss-crossed cemeteries, popular town squares, and in same cases led right up to people’s doors where they stopped and continued on in another direction (including back-tracking on top of themselves). They went into a shed and came out on the other side–apparently, whatever made them went through a six-inch hole. It soon became clear that the phenomenon was widespread, and some of the more scientifically minded examined the prints in detail. One naturalist sketched some of the marks and measured the distance between them. It was found to be eight and a half inches. This spacing seemed to be consistent wherever the tracks were measured. It was also noted that the way in which they were set out, one in front of the other, suggested a biped rather than a creature walking on four legs. Some clergymen suggested that the prints belonged to the Devil, who was roaming the countryside in search of sinners (a great ploy to fill the churches). A feeling of unease had spread through some of the population, who watched carefully to see if the strange footprints would return. They did not, but after a couple of days the news spread far beyond Devon and into international press. The phenomena sparked correspondence in some of the leading papers, including the Times and the Illustrated News, and led to a plethora of speculation by eminent scientists and laymen alike. Author Geoffrey Household suggested that “an experimental balloon” released by mistake from Devonport Dockyard had left the mysterious tracks by trailing two shackles on the end of its mooring ropes. His source was a local man, Major Carter, whose grandfather had worked at Devonport at the time. Carter claimed that the incident had been quieted because the balloon also wrecked a number of conservatories, greenhouses, and windows before finally descending to earth in Honiton. Mike Dash suggested that at least some of the prints, including some of those found on rooftops, could have been made by hopping rodents such as wood mice. The print left behind after a mouse leaps resembles that of a cloven animal, due to the motions of its limbs when it jumps. Dash stated that the theory that the Devon prints were made by rodents was originally proposed as long ago as March 1855, in The Illustrated London News. It is also often suggested that the footprints were merely a case of mass hysteria, caused by the sighting of various animal tracks and assuming them to be the same. However, none of these fit the account well, unless several animals of whichever variety began at different places and were too polite to intrude upon their neighbors. Maybe Old Mrs. Wade is the only sinful person left in South England. You go, grandma. “British and Foreign Gleanings”. South Australian Register (Adelaide, SA : 1839–1900). Adelaide, SA: National Library of Australia. 6 July 1855. p. 3. Retrieved 21 August 2013. “Miscellaneous Extracts.”. Bell’s Life in Sydney and Sporting Reviewer (NSW : 1845–1860). NSW: National Library of Australia. 26 May 1855. p. 1. Retrieved 21 August 2013. “Professor Owen on the foot-marks in the snow in Devon.” Illustrated London News, 26 (4 March 1855): 214. Household, Geoffrey (ed.) (1985). The Devil’s Footprints : The Great Devon Mystery as it was Reported in the Newspapers of 1855. Exeter: Devon Books. ISBN 0-86114-753-7.